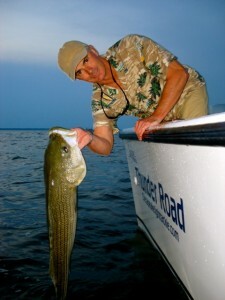 We’ve caught some very nice fish on Thunder Road over the past couple of weeks. 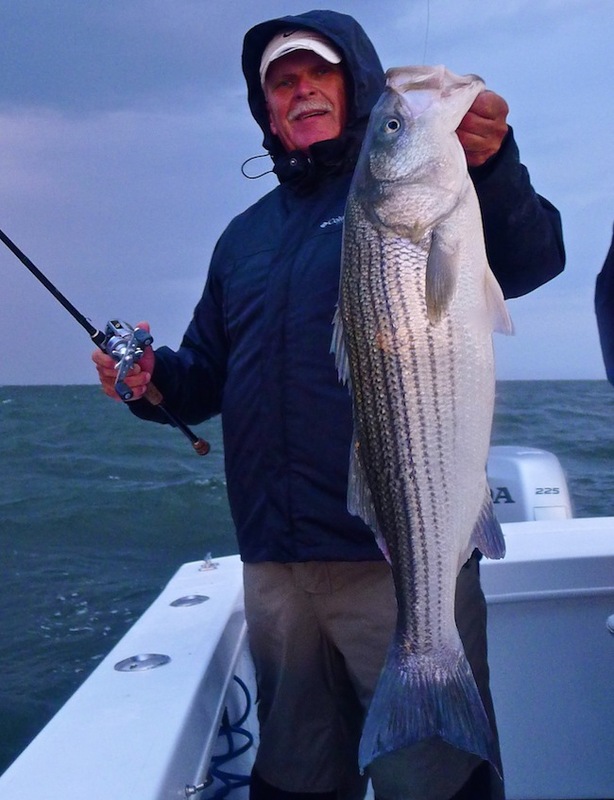 Whether in the shallows or on the ledges, it’s fall on the Chesapeake Bay and time for trophy striped bass. It’s a hot bite tonight. I’m fishing alone throwing topwater, a big chunky blue and silver Stillwater Smackit. Not my favorite plug, but pretty damn close. If you’ve read my book, you know where I am. 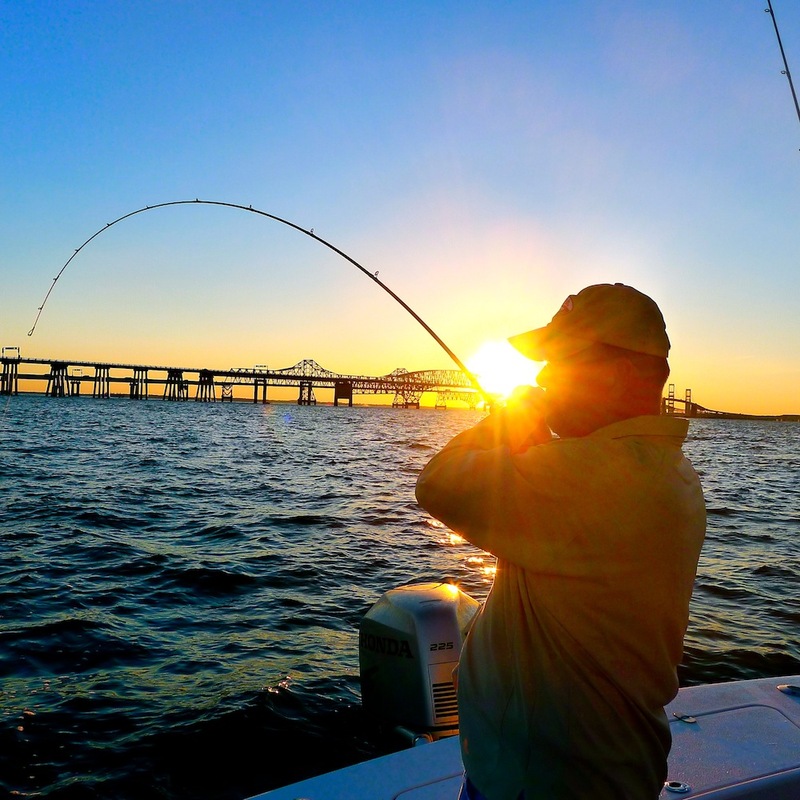 If you haven’t, turn to page 50 in this month’s Chesapeake Bay Magazine and in his article, “Autumn Angling,” John Page Williams will tell you exactly where. I’m right where John Page says I’ll be, working well inside the eight-foot-deep mark where the rocks come up to four. It’s a windy evening, too windy for topwater, but the bite is on and the fish don’t care. There’s a full-moon-outgoing, so lots of current, too much current to stay over the spot for very long. The wind is blowing 17 knots from the northeast and building ahead of an approaching cold front. I’m drifting across the rocks way too fast. I compensate by slinging my lure as far as I can to lengthen my angle of attack. I imagine my fishing spot as a giant rectangular canvas with my lure painting a streak from the top corner to the bottom. The fish won’t hit unless I’m working the surface within four feet on either side of the underwater rocks. Unlike jigging where we work with portrait strike zones, for topwater, they’re landscape. A dramatic orange and gold sunset is blazing over my right shoulder. Another reason to love surface fishing: the view. I can tell by listening that traffic on the bridge is slow. They’re not looking at the road. I’m not looking at the bridge. I make a strong cast toward the Kent Island shore. The lure catches the wind and sails, unwinding almost all the 12-pound-test mono off my stainless steel spinning reel spool. I watch my lure splash back toward me through the waves. Seas are rolling and my big plug occasionally disappears into a deep trough. When it comes up to the top of the wave, the red reflection of the setting sun glints off the silver top. Pop, pop, pop, pop, stop. Pop, pop, stop. Repeat. They want it erratic and violent tonight. Splashy. This evening’s strong fish aren’t interested in a limp-wristed retrieve. I’m using my medium action composite rod to get more recoil against the chug. All my senses are tuned-in to that lure. It’s the time of year when I need to be at the top of my game. I like my chances. Big fish explosion, real big. Way bigger than the 31-incher I released ten minutes ago. 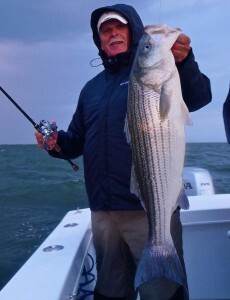 The huge striper came all the way out of the water after my lure, but my line didn’t come tight. C’mon, Kimbro, don’t stop. Keep the lure moving. I crouch down lower in the boat. I don’t want the big surface-feeding fish to see me. Keep working that plug, rod tip high, line above the water. Pop, pop, stop. Pop, pop, pop, BOOM! Another explosion and I resist the urge to set the hook. Wait for it, wait for the weight. The mono tightens up like a banjo string. I set the hook hard since I’m using barbless trebles and I need solid contact. The line stays tight. The fish is on. Instinct tells me to lower my rod quickly so the big fish can take drag. Oddly, the fish is thrashing on the surface and doesn’t run. I expect him to get straightened out and take off like a missile across the shallow flat. I don’t think I have enough line left on my reel. I’m in trouble. I reach down and turn the key to fire the Honda 225 on the back of my 27-foot Judge. From my vantage point nearly a hundred yards away, the striper looks huge. My only hope is to go after him. August and September are the only two months out of the year when I’ve failed to break the 40-inch rockfish barrier on the Chesapeake Bay. It’s September 30th. I have my shot. 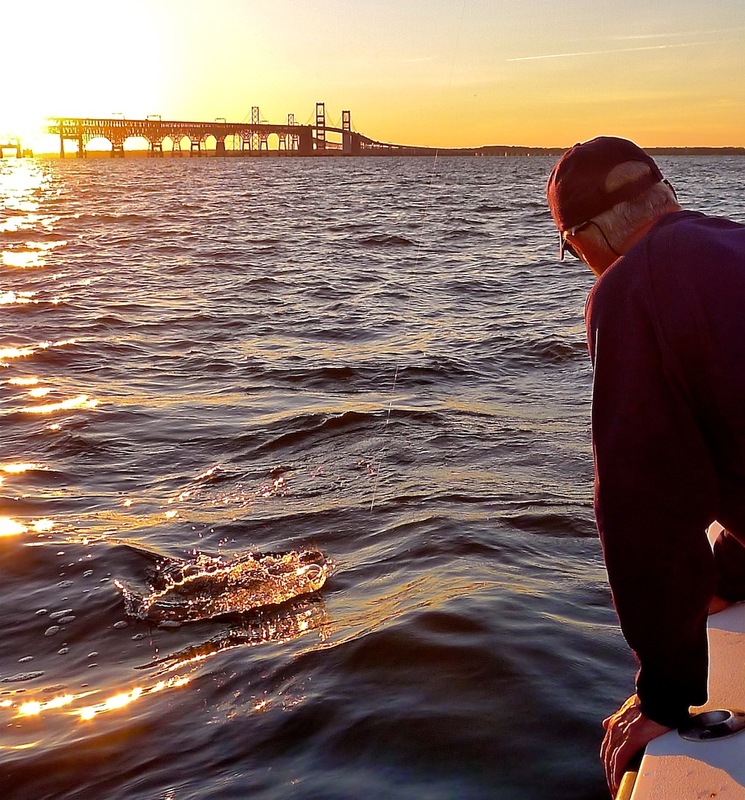 A half-dozen crab pot floats lie between me and the thrashing — not an easy mine-field to navigate under any circumstances, and especially not while holding my rod tip high and frantically taking up line while driving the boat with my hip. The fish is still on the surface. That’s crazy. I get close and jerk the shifter into neutral. Now I see what’s going on. The fish has lassoed himself. The 20-pound-test mono leader is completely wrapped around, pinning his pectoral fins to his body. He can thrash violently, but he can’t swim. My momentum carries me closer. I’m still frantically taking up line when the fish sees me and goes nuts. Now I’m wondering how I’ll ever get this monster into the boat. There’s no way to lip him. His mouth is closed with one treble hook in the top corner. The other trebles are slashing around dangerously as the big fish struggles. 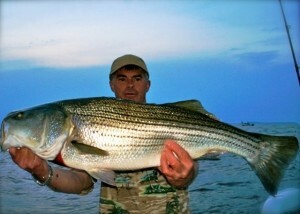 There’s still a lot of fight in this pissed-off striper, and I don’t have a net. I look down to shut off the engine and suddenly feel slack in my line. Uh, oh, more trouble. The increased exertion has untied the line from the fish’s body. Now free to swim, it suddenly shoots straight toward me. Before I can start reeling to take up line, he turns and speeds away. I have plenty of ine on my spool now, so my drag can handle the fish, but I’m still thick into crab pots. I tighten my drag a little, not much, maybe a quarter turn. My line goes slack. Dammit. I’ve lost him. It felt like the fish broke off, but I can still see my plug. I’m dejected and frustrated. What happened? Did the one remaining hook come free? I reel the lure into the boat and shake my head in disbelief. The strong striper has literally destroyed my Stillwater Smackit. I’ve landed plenty of big fish on lures like this one, and I have confidence in this plug, but I’ve never seen such a violent surfac e battle. The fish has slapped the plastic apart at the seams, and pulled the hook out of the back of the plug. I sit down on the leaning post and lower my head. I’m disappointed because it might be many years before I get another shot at a September 40-incher. In fact, it might never happen again. I console myself by thinking that I now have a memory of an epic fight with a big fish and a one-that-got-away-story that I won’t ever forget. As an appendix, I must tell you that I originally wrote this story on my laptop computer while flying from BWI to Grand Rapids, Michigan. I closed my computer prior to landing, and when I opened it back up, my story was gone. The original version was absolutely sublime. Complimented by superb snapshots, it was chock-full of perfect prepositions and magnificent metaphors. I’m sure it was way more entertaining than this one. Maybe the best I ever wrote. I bet you would’ve loved it. Here’s to the ones that got away! Felt like I was there wile reading …Whenever I fish that area,that’s the first place I go to.It has everything. Most pass by,that’s OK by me. Very entertaining story. Deserves to be published somewhere. Very interesting just as you always are. I wouldn’t be able to resist looking at such a pretty sunset. The guy in the last picture has a pretty shirt. Today I had the same thing happen on a brand new smackit jr. I had a nice fish on and during the fight it ripped off the back hook and nearly got the front one too. The split rings are what gave way but the loops they connect to are both twisted up. That’s an expensive lure to get beat up so easy. Should I be concerned about the split rings on my full size smackits too? Mr Kimbro, I got your book on Amazon in August and I’ve read it twice already. I didn’t like light tackle too much until now because I didn’t really know what I was missing. I’m still not always catching big fish like you and your crew do, but I am doing better than I ever have done before so I want to say thank you and also this is a very fun story. ES Fisherman. Why a Smackit Jr? I’ve never owned one and never intend to. Wimpy topwater plugs = wimpy fish or lost trophies. Saw you in Eastern Bay tonight. I couldn’t catch .an.ything but little ones. How did you do? We had a good night in E. Bay tonight fishing the shallows with big plugs. 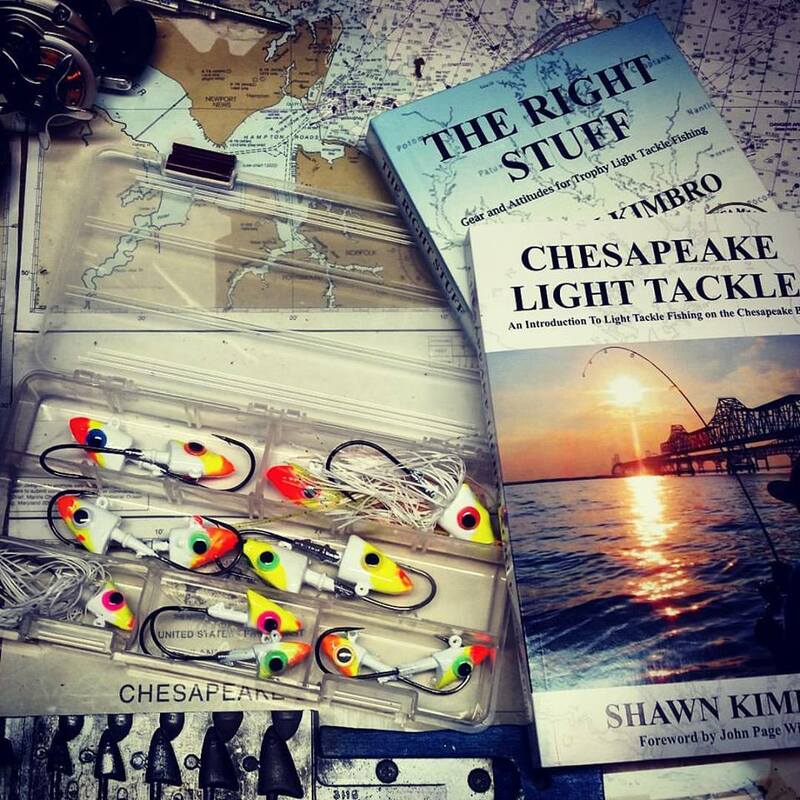 I posted a picture of one of our better fish on Facebook, so send me a friend request or become friends with ChesapeakeLightTackle the Book to see it. Thanks! I must of had that same fish on a couple days before at the same spot. When I hook him he came straight toward the boat then under the boat and kept on going. I think he has a thing for charging Judges. Great account, thanks . Your comments to ES Fisherman are spot on too . 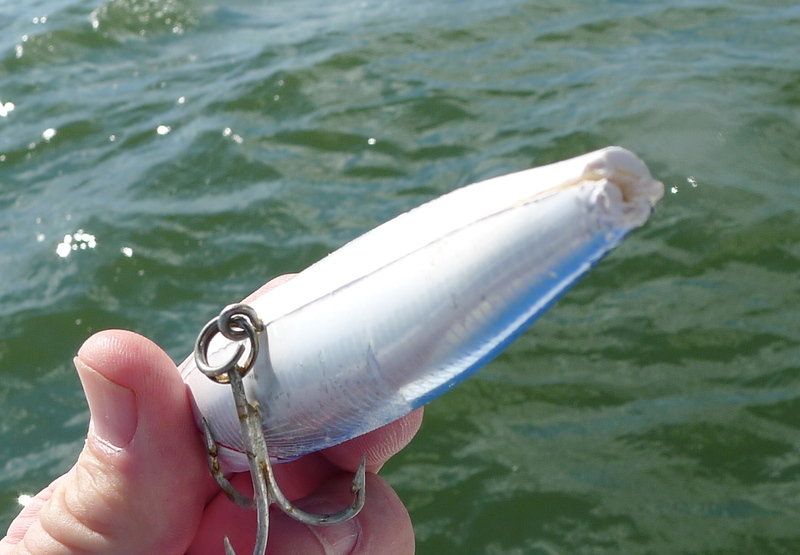 Why not fish a bigger lure ? 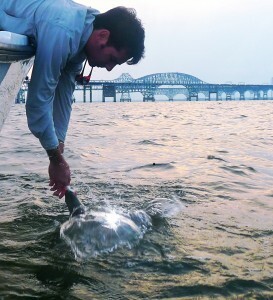 If your not hooking smaller fish you may not be announcing your presence to the other fish . 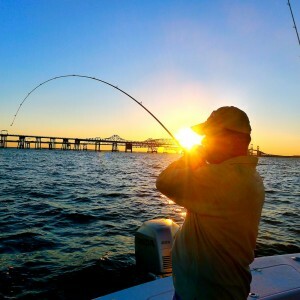 Loosing a nice fish like that is bothersome and I often recount the event over and over in my mind… sometimes they visit me in my sleep… but it is their laughter that haunts me the most… Thanks for another good read!